Q: The leaders of the DPRK and the ROK today inked the Pyongyang Joint Declaration of September, which states theirwill on achieving the denuclearization of the Korean Peninsula, improving their relations and easing military tensions. In response to this declaration, US President Trump said that Chairman Kim Jong Un has agreed to inspection and verification of the nuclear facilities in the DPRK. What is your comment? A: We have noted relevant reports. The leaders of the DPRK and the ROK held another summit in Pyongyang, during which the two sides signed the Pyongyang Joint Declaration of September and reached new important consensus on improving and developing their relations, easing military tensions of the region and moving forward the denuclearization and peace talks process of the Korean Peninsula. We welcome this and commend the positive efforts made by the two sides. Peace and prosperity as well as reconciliation and cooperation represent the shared aspirations of the people on the Korean Peninsula and in the region. 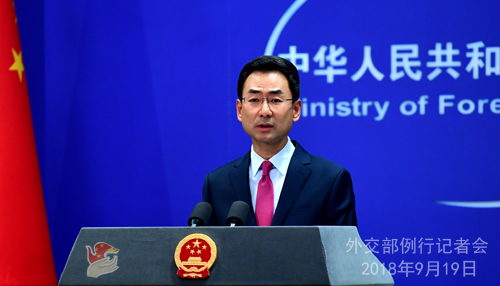 As a close neighbor to the Korean Peninsula, China always supports the DPRK and ROK in improving their relations through dialogue and consultation and promoting reconciliation and cooperation. We hope that the DPRK and the ROK can continue to implement the consensus in relevant declarations, strive to promote their interactions and cooperation and play a positive role in politically resolving the Korean Peninsula issue and achieving the long-standing peace of the region. Q: With regard to the China-US trade disputes, can you confirm whether or not a Chinese delegation will be going to the US for trade talks this or next week? If so, who will lead that delegation? A: I have no information to offer for this question. Like I said yesterday, the Chinese side maintains that dialogue and consultation on the basis of equality, good faith and mutual respect make the only viable way out for the China-US trade issues. However, everything the US does for now gives no impression of sincerity or goodwill. Q: Some media report that the US government asked relevant Chinese media agencies in the US to register as "foreign agents". What's your comment? A: Media serve as an import bridge and bond to enhance communications and understandings between people of different countries. Countries should perceive media's role in promoting international exchange and cooperation in an open and inclusive spirit. They need to facilitate rather than obstruct media's normal work, still less politicalizing the relevant issue. Q: FOX News reported that Pentagon on Tuesday unveiled its first cyber security strategy report, saying that the US has been engaged in long-term strategic competition with Russia and China. It also said that China has sought to "steal" sensitive information from the American government and private-sector institutions. Do you have any comment? A: I haven't yet seen this news report you mentioned or the report released by the Pentagon and I need to check on that. Regarding the US accusations of China "stealing" sensitive information via the Internet, we have made clear our position many times and I won't repeat that. As a principle, we hope the US side will discard the cold-war and zero-sum mindset and put the China-US relations in perspective. As we have been stressing, the sound and steady development of China-US relations not only serve the interests of both countries, but also meet the shared aspiration of the international community. We hope the US will work with China to this end. 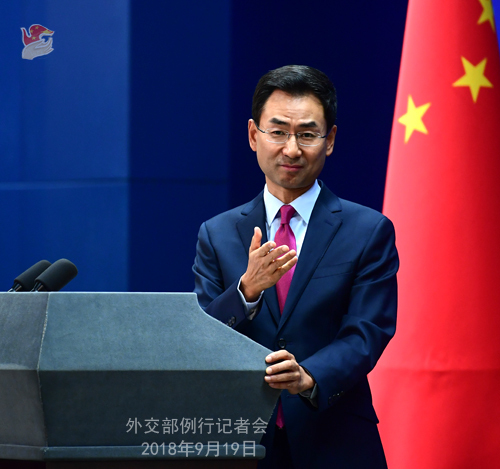 I would also like to stress that China commits itself to working with other members of the international community to build a new type of international relations featuring mutual respect, fairness and justice and win-win cooperation and a community with a shared future for mankind. We are also willing to work with Russia and the US in this respect. Q: Can you confirm that a delegation from the Vatican will be visiting China later this month? What will be discussed and what sort of deals will be signed? A: If I remember correctly, I already took similar questions the other day. I shall say that I have no information to offer at this point. China and the Vatican maintain effective contact. 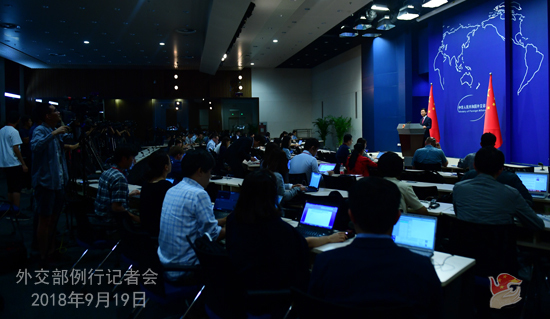 Q: As to the US demand that relevant Chinese media outlets in the US be registered as "foreign agents", will China consider some reciprocal response on the US media agencies? Has the Chinese government made any official representation to the US government regarding this? A: As far as I know, China and the US have had communications on this issue, and the US side is aware of China's stance. Like I just said, we hope relevant side will facilitate and create enabling conditions for normal work of media rather than obstructing them. China has been supporting and facilitating foreign media's normal reporting in China. We also hope foreign media in China will abide by Chinese laws and regulations and cover China in a objective and unbiased manner. Q: As to China-US trade disputes, the US yesterday said that they are going to go ahead and probably announce tariffs on another $267 billions worth of Chinese goods. Should we presume that for the time being, you are ruling out talks between China and the US? A: Like I said, dialogue and consultation on the basis of equality, good faith and mutual respect make the only viable way out for the China-US trade issues. However, everything the US does for now gives no impression of sincerity or goodwill. Q: This week, the Indian government reportedly banned ZTE and Huawei from the 5G network trial in the country. Do you have any comment? Is the Chinese side in touch with the Indian government on this? A: We have noted the relevant report. The Chinese government always encourages Chinese enterprises to carry out economic and trade cooperation on the basis of observing international rules and local laws. We also hope that the relevant country can provide a fair, just and transparent environment for Chinese businesses to operate there. The China-India economic cooperation and trade are mutually beneficial in nature and now they are going smoothly on the whole. Q: On September 18, the US side announced that it would impose additional tariffs on $200 billion worth of imported Chinese goods. US Secretary of Commerce Wilbur Ross said in an interview that the US intends to conduct constructive talks with China to address the fundamental issues. He added that as to when the talks would start, "the ball is in China's court". What is your response to that? A: It is not the first time for the US side to say that "the ball is in China's court". I would like to take some time to help you restore the truth. US Secretary of Commerce Wilbur Ross held trade talks with the Chinese side in Beijing from June 2 to 3. A few fays before the trade talks, that was on May 29, the US announced the imposition of additional tariffs on $50 billion worth of Chinese goods. From August 22 to 23, China and the United States held trade talks at the vice-ministerial level in Washington D.C. On the day when the talks ended, that was on August 23, the US slapped tariffs on additional $16 billion worth of imported Chinese goods. Not long ago, the Chinese side received the invitation from the US side on holding another round of trade talks and our two sides are in communication on relevant details. However, yesterday, the US announced that it would impose additional tariffs on $200 billion worth of imported Chinese goods and take other tariff escalation measures. The US side has kept talking up about dialogue and contact while wielding the big stick of sanctions. It sent the invitation for trade talks while imposing maximum pressure. It seems like the US is up to its old tricks again, but we know that only too well and remain unruffled. Here I want to stress the following two points. Firstly, the US' threat, intimidation and blackmail will not work on China. We will unswervingly push forward the reform and opening up according to our own timetable and road map and continue to resolutely safeguard our legitimate and legal rights and interests. Secondly, the China-US economic cooperation and trade are mutually beneficial in nature. It's only natural that we may have some differences. Dialogue and consultation on the basis of equality, good faith and mutual respect make the only viable way out for the China-US trade issues. We hope that the US side can show goodwill and sincerity. Q: Should we presume from your answer that you are leaving room for talks? A: The trade disputes can only be resolved through dialogue and consultation on the basis of equality, good faith and mutual respect. Q: The US side claimed that China intends to meddle in their mid-term elections. What is your response to that? A: People who know well of China's foreign policies should be clear that we always follow the principle of non-interference in other countries' internal affairs. We will not interfere in other countries' domestic affairs and we also hope that other countries will not meddle in ours.